Firstly, go and make yourself a 64 bit Haiku AnyBoot USB key. You’ll need at least a 600MB USB stick for this. I used the latest hrev53001 release. Now with a working USB stick, insert it in to the Recoil II laptop, and reboot. It should boot to the USB stick and show a Haiku loading page. If it doesn’t, hit F2 on boot and alter the boot order so the USB stick is first. NOTE: You WILL need to DISABLE secure boot in the BIOS anyway. Best do this now. By default the Keyboard and Trackpad WON’T be detected, so plug in an external USB keyboard and mouse now. On booting from the USB stick, select the correct keyboard layout and language. When you see the install page it will complain that you don’t have a Haiku disc to install on to. This is expected. Select Partition -> Create -> Be File System. I set this to 34000 (31 GB) in size. Haiku is a very small install, so this is probably overkill, but I have the whole source tree on my laptop and dev for Haiku on Haiku, so most developers will want to do this. Confused??? Look at the image at the bottom of this post – your drive should look like this. Click on the Leaf in the top right corner (A Haiku start menu, if you will), and select Applications, Drive Setup (Yes, you’ve just been here). Right click the efiboot partition, and select ‘Mount’. You will notice a drive appear on the desktop. Click this to open it. 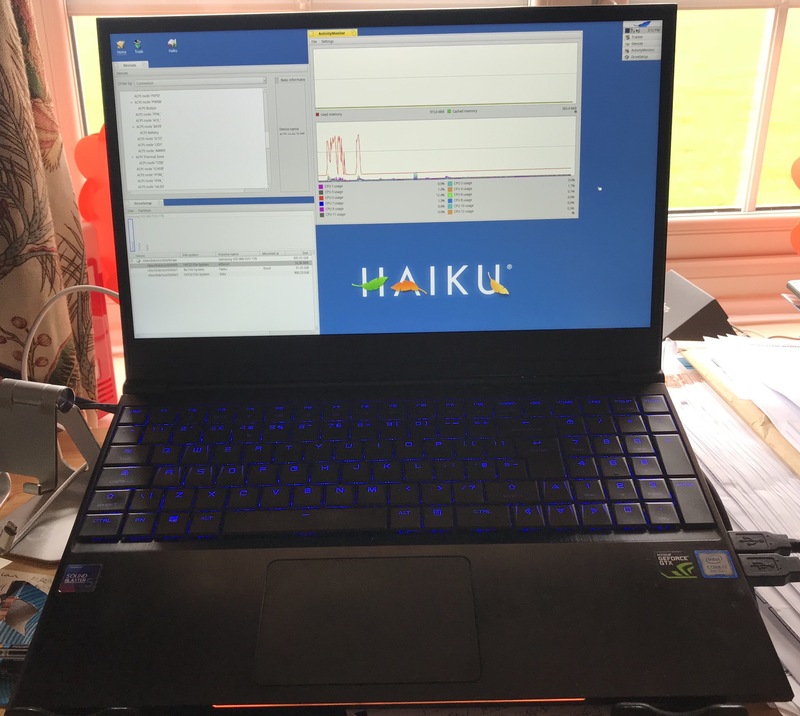 So the Thermal management (fan speed) works much better on Haiku for this laptop than it ever has on Linux and Windows. No thrashing fans unlike the other platforms. The Intel UHD graphics driver works fine too. The screen goes to sleep after a while too. The Ethernet (cable) network works fine and fast too. The keyboard backlight does work, but you can’t turn it off. It’s a Clevo ACPI WMI device (clevo-xsm-wmi.c is the linux driver, to be precise) with a programmable colour LED per key. This currently is not supported in other colours on Windows, Linux or Haiku right now – only on boot in the bios, which is annoying!!! I really REALLY want to be able to have a pretty colour pattern at will on this machine… Although to be fair, not being able to actually type is the main priority right now. Let me know how you get on installing Haiku on modern 64 bit hardware.